These boozy gin-soaked cranberries can be used in a plethora of Christmas recipes. Layer up in a trifle, use as a topping, serve with pannacotta or try turning them into a festive cranachan. Put the sugar, orange zest and orange juice in a large pan and leave over a low heat until the sugar has dissolved. Add the gin to the pan and bring to the boil. Add the cranberries, bring back to a simmer and cook gently for 5 minutes until the berries have softened but are holding their shape. Remove the cranberries from the syrup using a slotted spoon and divide equally among the jars. Return the syrup to the heat and simmer vigorously for about 6 minutes until reduced to 600ml. Divide the hot syrup among the jars, seal and leave to cool. Store in the fridge until needed (see Make Ahead). For ideas on how to use the boozy berries, see previous page. 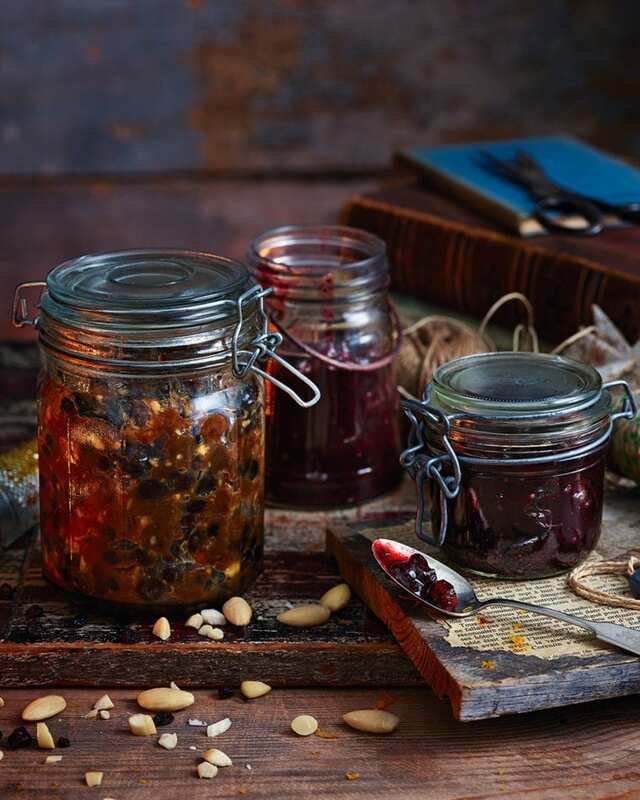 The cooked and cooled boozy cranberries will keep in sterilised, sealed jars for up to 2 months.